Astronomers have created a global topographic map of Saturn’s moon Titan using the now-complete Cassini data set. The map opens new avenues for understanding the moon’s liquid flows and terrain. Two papers, both in Geophysical Review Letters, describe the map and discoveries arising from it. Creating the map took about a year, according to Paul Corlies, a doctoral student at Cornell University and first author of the first of the two papers. The map combines all of the Titan topography data from multiple sources. Since only about 9 percent of Titan has been observed in relatively high-resolution topography, with 25-30 percent of the topography imaged in lower resolution, the remainder of the moon was mapped using an interpolation algorithm and a global minimization process, which reduced errors such as those arising from spacecraft location. The map reveals several new features on Titan, including new mountains, none higher than 700 meters. The map also provides a global view of the highs and lows of Titan’s topography, which enabled the scientists to confirm that two locations in the equatorial region of Titan are in fact depressions that could be either ancient, dried seas or cryovolcanic flows. The map also revealed that Titan is a little bit flatter—more oblate—than was previously known, which suggests there is more variability in the thickness of Titan’s crust than previously thought. “The main point of the work was to create a map for use by the scientific community,” says Corlies. Within 30 minutes of the data set being available online, he began to receive inquiries on how to use it. The data set is downloadable in the form of the observed data, as well as that data plus interpolated data that was not observed. The map will be important for those modeling Titan’s climate, studying Titan’s shape and gravity, and testing interior models, as well as for those seeking to understand morphologic land forms on Titan. The second paper finds three important results using the new map’s topographical data. “We’re measuring the elevation of a liquid surface on another body 10 astronomical units away from the sun to an accuracy of roughly 40 centimeters. Because we have such amazing accuracy we were able to see that between these two seas the elevation varied smoothly about 11 meters, relative to the center of mass of Titan, consistent with the expected change in the gravitational potential,” says senior author Alex Hayes, assistant professor of astronomy. The paper’s second result proves a hypothesis that Hayes advanced in a previous paper: that Titan’s lakes communicate with each other through the subsurface. Hayes and his team measured the elevation of lakes filled with liquid as well as those that are now dry, and found that lakes exist hundreds of meters above sea level, and that within a watershed, the floors of the empty lakes are all at higher elevations than the filled lakes in their vicinity. The paper’s final result raises a new mystery for Titan. 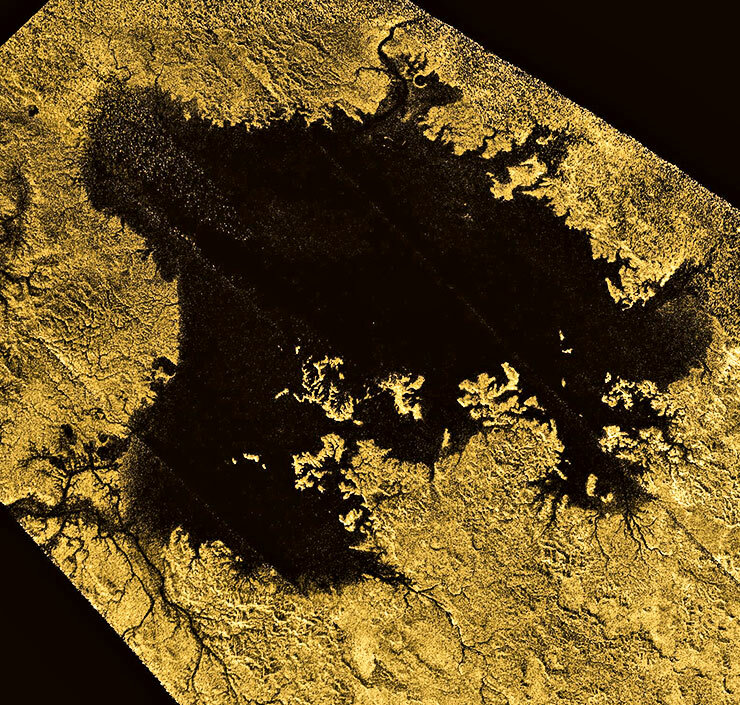 Researchers found that the vast majority of Titan’s lakes sit in sharp-edged depressions that “literally look like you took a cookie cutter and cut out holes in Titan’s surface,” Hayes says. The lakes are surrounded by high ridges, hundreds of meters high in some places. Could Dragonfly drone find signs of life on Titan? “But if these things do grow outward, does that mean you’re destroying and recreating the rims all the time and that the rims are moving outward with it? Understanding these things is in my opinion the lynchpin to understanding the evolution of the polar basins on Titan,” says Hayes. Funding for the research came from grants from NASA and the Italian Space Agency.